By Moya Sherriff, Intern, Canterbury Cultural Collections Recovery Centre. Moya Sherriff will be interning at the Canterbury Cultural Collections Recovery Centre (CCCRC) for a year, under National Services Te Paerangi’s Museum Graduate Internship Programme, with support from the Friends of Te Papa and OMV New Zealand. Moya will be writing a monthly update about her experiences as CCCRC intern. 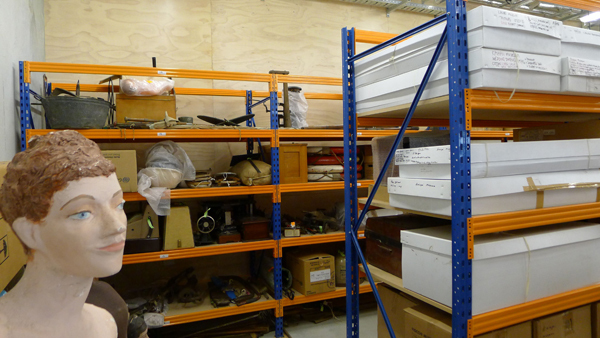 This is the first in a series of blogs from the Canterbury Cultural Collections Recovery Centre (CCCRC) located at the Air Force Museum, Christchurch. This internship role is funded for 12 months. Many thanks to National Services Te Paerangi, the Friends of Te Papa and OMV New Zealand for making this opportunity possible. Moya building shelves at the CCCRC. Image courtesy of CCCRC. I am a Cantabrian, originally from a farming background just outside of Temuka. I spent my University years in Christchurch, in between working part-time and volunteering at South Canterbury Museum over the holidays. Eventually this led to a short term contact under Task Force Green as a Museum Assistant. The beauty of working at South Canterbury Museum was the variety of experiences I was exposed to, both at the back and front of house. One of the most memorable moments was helping the Exhibitions Technician pull down a woolshed using rope, a truck and a set of wire cutters for the re-creation of the ‘Strathallan’ ship cabin that featured in the ‘Timaru at Last!’ exhibition. After South Canterbury Museum, I took a position as Curator of Documentary History at Ashburton Museum. At this point I enrolled with the Massey University Museum Studies programme. While at Ashburton, one of the highlights of my role was to work with the Museum’s volunteers. Their passion for the District and the preservation of its past made going to work something I looked forward too. After Ashburton, I took a year out backpacking for nine months across Asia, ending up in Northern Ireland for a short period of time. On returning to New Zealand, I started volunteering at the Air Force Museum and recommenced my studies. The major draw of the CCCRC position for me is being able to work once again with volunteers and play a part in the rebuilding of Canterbury. The opportunity to work with such a variety of collections is also exciting, while being able to broaden and refine my knowledge with the support of my fellow Museum colleagues. That was just some background information before we move onto my first few weeks within the CCCRC. 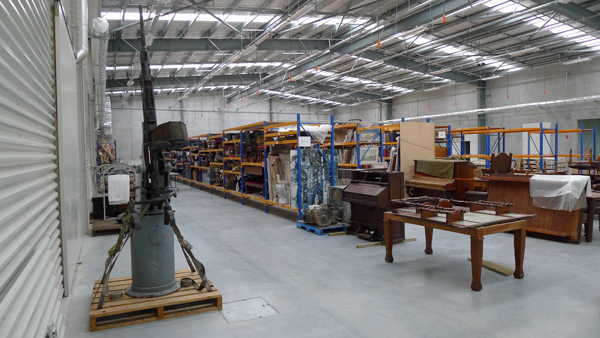 In November 2011, the Air Force Museum started construction on a new building development, to create an extension for the exhibition, restoration and conservation spaces of the large object collections. The Canterbury earthquakes in 2010 and 2011 created a risk in building at this time, but the risk paid off when the extension was completed in February 2013. At the moment, the area intended for exhibition is acting as one of Christchurch’s major event centres. 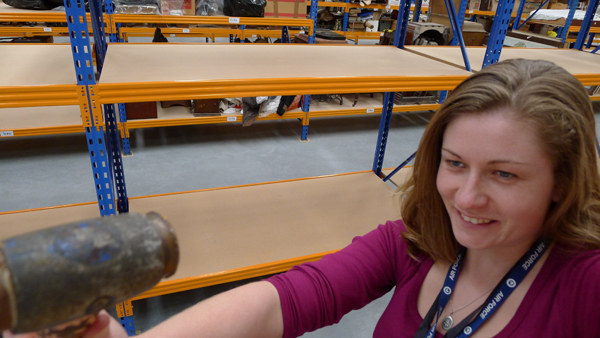 Beside it, the space set aside for restoration and conservation workshops on large objects, is to be the home of the Canterbury Cultural Collections Recovery Centre (CCCRC) for the next three years. The role of the CCCRC is to provide a free space for those cultural organisations within Canterbury who have either lost their premises due to the earthquakes or are in need of temporary collection storage while their buildings are going through the EQC repair process. Each group has been given a designated storage area within the Recovery Centre and a shared workspace where organisations can re-group, assess the consequences and needs of collections and begin the processes of documentation, cataloguing and boxing, while having access to conservation treatments. My role within the CCCRC is to assist these groups throughout this process of re-establishment, through the guidance of my supervisor Darren Hammond, Curatorial Officer, and the leadership of Therese Angelo, Director at the Air Force Museum. Over the past two weeks here, the primary objective has been to create a timetable of when the groups would like to come in and work with their collections. This has resulted in a CCCRC working week of Tuesday to Saturday, so that working volunteers have weekend access to the Recovery Centre. Over the next few weeks we have additional groups moving into the centre, either from various locations across the city or finally moving out of shipping containers on the tarmac at the Air Force Museum. This has meant recently my time has involved co-ordinating when groups can move in and ensuring spaces are ready for them. We all hope that the CCCRC will provide not only practical help to our cultural heritage in Canterbury but also form lasting institutional relationships and opportunities for community collaborations.